Bats are very small animals that can fit into tight spaces and can hinder your day to day tasks in your home. As we get into colder months, many of our customers come in contact with Bats in their chimney when they want to light a fire. 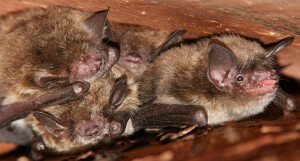 Hayman Wildlife Management is fully equipped and specially trained to handle Bats that have infested your chimney. Our Wildlife Experts are trained to not only humanely remove the Bats, but also inspect and repair any entry points your chimney may have. The most important thing to remember is when your chimney is not in use, make sure you close the damper. This will make it harder for Bats and other wildlife to enter your property through the chimney. Do not start a fire to rid your chimney of Bats! It is illegal and inhumane to kill a Bat and a fire will most likely make the Bats fly down the chimney instead of up and out. Not all Bats will fly out at once so it is important to have a Bat Removal Expert inspect your entire property to ensure all the bats are gone and that the entry ways are closed up correctly. All the entry points must be covered or the Bat removal job will ultimately fail. Hayman Wildlife Management Experts are fully licensed, specially equipped and expertly trained to handle your Bat removal and Bat control needs. Call us at 269-588-0176 to schedule an inspection by one of Hayman Wildlife Managements Wildlife Experts.